You've probably heard of the movie "300" which is coming to theatres tomorrow. The movie, which is about the Battle of Thermopylae between the Greek and the Persians is closely based on a comic book by Frank Miller (the author of Sin City). Update: What I said below is not correct since according to Wikipedia, the director has claimed the movie is 90% historically accurate!! - Also see: 300 the movie (A nice collection of artwork and articles related to "300" and ancient Persia). 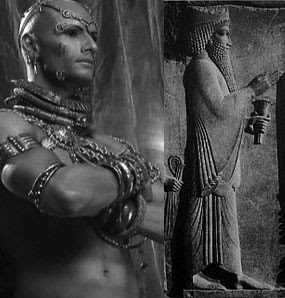 One thing to add, according to history, Xerxes (son of Darius the great) was nothing like his father or Cyrus the great... however he was not a pierced savage either! * In the picture above, Xerxes is the prince and not the king yet. In the full picture shows him standing behind his father Darius. * You may also want to see the video in one of my previous posts (In Search of Cyrus The Great) that explains greek authors have introduced Persians as savages. - I posted some very interesting videos of the Persepolis (including Xerxes) in Persepolis Recreated. Posted by Hooman at 3:00 p.m.
April 04, 2007 9:45 p.m. I saw this movie, and I was really mad about the way it pictured Persians. But after reading about it and filtering ignorant comments, I have came to understand it in a different light. First of all, I now assume that neither the director nor Frank Miller wanted to harm Iran's image, they simply depict how Spartans viewed the Persians. You can't kill someone if you see him as a human like you, with hopes and fears, who has parents and kids waiting for him. Remember what they teach soldiers in any army, the enemy is always a monster. Secondly, I think that most people who see this movie don't even know that Persians are Iranians, and I'm sure that those who know are intelligent enough to see that this is just a fiction based on history. Finally (and sadly), between you and me, the Persian Empire must have been as arrogant State as today's American empire. Iranian culture is rich from incorporating many influences, it has changed so much from what we were 2500 years ago. I wish that someday Iranians can be admired around the world for their culture, their kindness toward other nations, their bright and cultivated people and their achievements. Then we will not even be forced to defend ourselves for being compared to demons. Until then, we have a lot of work to do… let's start by making Shahnameh truly known to all iranians. April 19, 2007 10:09 p.m.